Yang being blessed with wisdom to lead the U.S. into a more promising tomorrow. I shall give to you, my audience, a story of great significance. An uprise that shall not be forgotten. The end to the shackles put upon us by the oppressors. The Tale of Andrew Yang. We begin our epic in Schenectady, NY on January 13, 1975, where a small boy was born to bring upon a utopia of our society. This boy’s name was Andrew Yang. The legend who was destined to tame the rise of automation, and free the people from their hopeless situation riddled with unemployment and poverty. 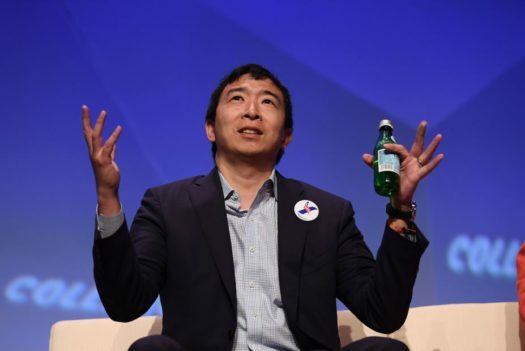 A situation with perils so dangerous only Andrew Yang could take on the quest of drafting. If we look to the humble begins of Andrew the Mighty. A kid who lived a nerdy early life in New York of course with an intelligence so unhinged it can not be contained with a mere number (our sources have estimated an IQ of 215+). Even with this mass intellect, Yang was still tormented by the bullies of his school days, but with an unbroken spirit, he pronounced “I’ll show you! One day I shall be a successful entrepreneur and even president. Then I’ll kill all of you and hide the bodies.” Okay, wait not that last part. Then Yang went off to do bigger and better things. Yangis went forth to be granted two holy scriptures: a degree from Columbia Law School and another from Brown University. These scriptures instantaneously gifted knowledge to Yangis and made him, quite frankly, better than other people. Yangis, after gaining these holy scriptures, began a career as a corporate lawyer. After it had come to Yangis’ realization that he would have to sacrifice ethics for money, he ventured into entrepreneurship. First, Yangious had to find the knowledge as to how he could create a business. He trekked far and wide to find someone from whom he could gain this imperative knowledge. After this journey, he eventually found the individuals who would satisfy the his desires of wisdom…in a healthcare startup. After being granted this wisdom, Yangious went off to step two of three. Start a business. Yangiousol had formed a company to educate this country’s people, rising to the top along the way and becaming the number one education company in America. Venture for America was the ship, and Yangiousol was its captain. Rather than becoming a pirate and pushing down the American people, Yangiousol sailed forth across the sea of entrepreneurship and gifted to other sailors of this ocean the power of knowledge. These accomplishments did not go without recognition. The previous leader of the United States of America Barack Hussein Obama II even honored Yangiousol with the title of “Champion of Change” in 2012. After this quest had been completed Yangiousol set his ship to a new horizon, also known as step three.